In The Moral Animal, published in 1994, Wright outlined how human desires were selected for by evolution and noted that the result is that we are not necessarily designed to see the world clearly or to be satisfied. But if we concede the human brain’s design has been selected to court unease, impatience, jealousy and depression, then what are we as individuals to do about it? 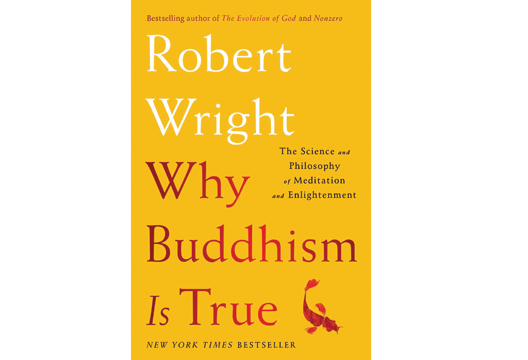 In Why Buddhism Is True, Wright makes the case for mindfulness meditation rooted in Buddhist philosophy as a practical way to dispel the delusions that lead to the suffering we feel, fastened to the hedonistic treadmill. Where CBT interrogates the logic behind intrusive thoughts, Wright argues that Buddhist meditation seeks to disembody thought in order to rebel against the agenda set for us by natural selection. We may not be in a position to defy our biological engineering but through meditation rooted in Buddhist philosophy, it is possible to detach from the oleaginous rails of our desires and simultaneously sit with noetic conflicts that we may ordinarily seek to escape and at least periodically wrangle our emotion life into a collaborative space rather than be blindly driven by naturally selected needs that are heretofore obscured from our view.